Review: "Greyhaven: Greyhaven" - Sea of Tranquility - The Web Destination for Progressive Music! I discovered Greyhaven through its talented founding member and keyboard player, Ethan Matthews, who, since the demise of the band, has started his own solo project called Echo Us. This is very dark prog metal with tons of synths and keyboards, ethereal guitars and a successful rhythm section from a young American band. Keyboardist Matthews creates waves and layers of ethereal soundscapes and blends them with Nate Howard's characterized lead guitar work. Drummer, Nick Cipriano, supports them while their singer, Brian Francis, has a very toned down, melodic and yet still assertive singing style. 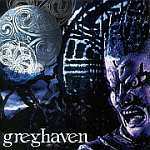 Greyhaven's self-titled disc, to me, is the epitome of DARK prog metal. What I call dark prog is the kind of music Tad Morose used to play on their first two albums with atmospheric keyboards. However, I would moreso compare this 62-minute CD to the German prog band, Payne's Gray, and the ultra-obscure American act, Gone. Both bands employ dark, gloomy prog with emphasis on atmosphere and feel, rather than showmanship. The melodic sensibilities of Eternity X and Ethan Matthews' current project, Echo Us, are also vague reference points to these ears. The album begins with Matthews' slightly electronic keyboard sequencing as the drums and guitars (no bass on this album) secretly engulf Matthews' melodies. This little instrumental song is followed by a truly progressive piece that has sharp guitar rhythms searing through the song as nice, clean vocals make their way into the mix. Brian Francis has a pretty non-prog style; don't expect a second Geoff Tate or John Arch here. His vocals are more laid-back and midrange with less high screams. The acoustic ballad, "Downfall", (with TONS of keys) is the apex of his singing. The vocal production could have been better; it seems a tad drowned by the keys and rhythm guitars. The tune ends with a stylish keyboard solo run, something you won't hear too much on this album. "Approaching the Twilight" is the other compact track, which contains several shifts of harmony and reinvented melodies. You will be shocked when you hear the number of tempo changes, different melodies, contrasting rhythm work that abound the songs here. This is progressive in the truest sense of the word indeed. There are, of course, longer songs on this disc as well. The 9-minute "Mirror My Eyes" is the first track that gives vocalist Brian Francis a lot of room to showcase his melodic delivery. The drumming, unfortunately, sounds a bit dry and too far back in the mix, but given the fact that this is the self-released debut album by a bunch of talented guys in their early 20's, that is more than acceptable. Five minutes into "Mirror My Eyes", we are confronted with a much heavier soundscape that proves the band is capable of creating rock-heavy riffs if necessary. "Shards of Sky" is the longest song as it runs over 11 minutes. Matthews' sparse, exquisite keyboard textures are more than impressive. Why don't we have more keyboardists like this guy anymore? The song has a myriad of melodies and harmonies, and yet, it still sounds scaringly organic and consistent. "Solitude Surrounding", as the song title suggests, is the musical transformation of solitude. It's the most ambient song on the album and connects with the ambient and very organ-driven title track, "Greyhaven". The song bleeds atmosphere in a dark, evocative landscape, and has a very slow tempo that draws the listener in its tragic flow and sweeps him away. Unfortunately, this band is no more. I really hope that one day Ethan Matthews' and his friends get back together and release something similar in this vein, be it under the Greyhaven moniker or not.